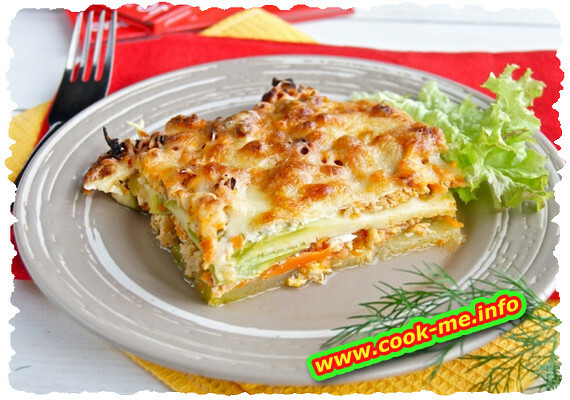 A good lasagna recipe – a great Bechamel sauce. Chop the onion and the pepper, grate the carrot. For the meat mixture: Fry the onion in heated oil, add the carrot and the pepper. Pour 1/2 cup of water and let it simmer. When the water starts evaporating, add the meat and stir. Pour the wine and season to taste with salt, pepper and basil. Simmer until the wine evaporates. For the Bechamel sauce: In a saucepan melt butter and add the flour. Stir continuously for about 1-2 minutes. Add warm milk and mix constantly with a whisk until the sauce begins to thicken. Take off the heat and season to taste with spices. Grease with butter a heat-resistant trey. On the bottom, place a layer of lasagna sheets, then a layer of meat mixture, then a layer of Behcamel sauce, then grated cheese. Repeat this until the mixture is over. The final layer consists of lasagna sheets. Beat the 2 eggs and pour over the lasagna; sprinkle some grated cheese. Bake in the preheated oven for 40 minutes until it becomes light-brown.